Even though one of my colleagues is not too fond of Litecoin and sees no use case for it, this is still one of the biggest coins, most active development teams and the second safest network in crypto space in terms of hashpower. According to one Litecoin publication on Medium, the Litecoin network processed one of its largest and most valuable transactions ever, Ł1,159,005.90779568 valued at ~$62M and all it cost to send was Ł0.00922 ($0.5). The transaction happened last week. The Transaction appears to be a consolidation of funds into a new Multi-Signature / Segwit ‘M’ address from a handful of Legacy addresses. 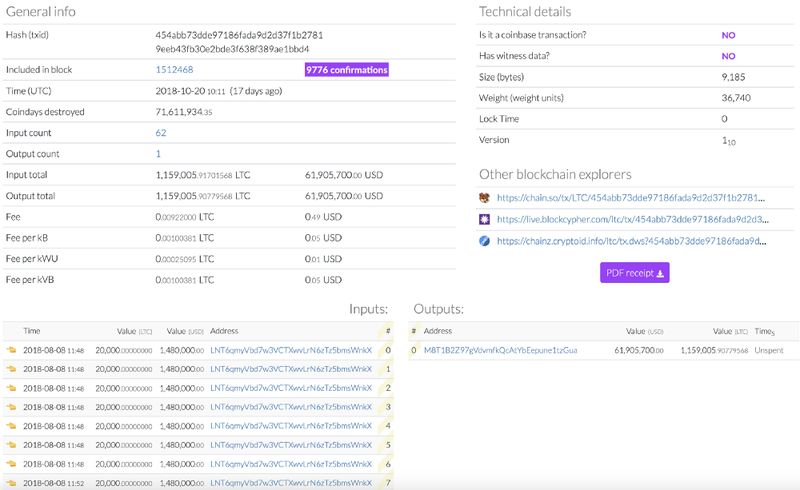 The transaction which created the new richest address on the network was made by the previous richest address on the network which is now lies empty. In the process a staggering 71,618,997 coin days were also destroyed. Of course, it is hard to know who owns the address, but most plausible option is that the address belongs to a cold storage of one of the bigger exchanges. The funds moved to the multisig address to heighten the security level of the funds as this means multiple parties need to sign the transaction before it is valid. Multisignature addresses require a combination of multiple private keys. Since these take advantage of newer features, they begin with the newer prefix of 3 instead of the older 1. These can be thought of as the equivalent of writing a check to two parties – “pay to the order of somebody AND somebody else” – where both parties must endorse the check in order to receive the funds. As Fxstreet analyses .. “The Litecoin price was seen nursing modest losses of just some 1% on Friday, however current price action and pattern formation remains somewhat worrying. LTC/USD is running in its third consecutive sessions of losses. Price action for LTC/USD has been moving within a descending channel formation, quite a steep one to the downside. This technical set up began to take shape after the high print on 7th November, up at $56.54. The post Setting new records: $62 million of Litecoin (LTC) moved for less than $0.50 appeared first on CaptainAltcoin.